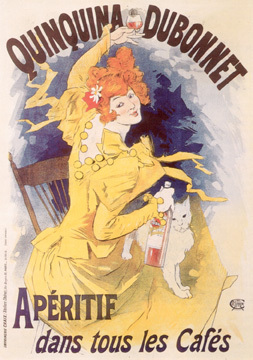 Chéret produced three different designs for Quinquina Dubonnet, all featuring a beautiful young woman with a contented white cat. The cat is a compliment to Mme. Dubonnet, whose own cat was included in the firm's logo. Here, the young woman, seated with the cat in her lap, lifts her glass to us in an inviting toast.